The first method and the simplest way, is to go to your local jeweller and they will be able to measure your finger for your correct size. 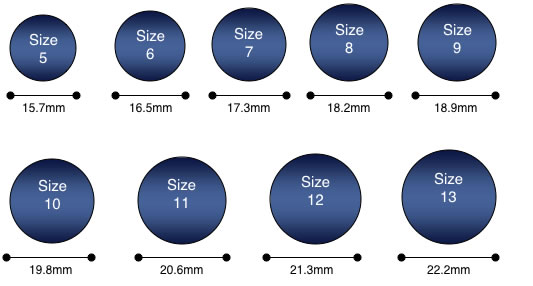 The second method is a little more complicated but just as effective, start by measuring the ‘inside diameter’ of a ring that already fits the finger and check the number that correlates with the measurement on the ring size guide above (inches). The third method is to use our Ring Sizer below. In order to print the Ring Sizer, be sure that your printer is set to 100%. In other words, make sure that you have not reduced the print size in 'page set up.' You can verify that the Ring Sizer printed correctly by measuring the printed version with the actual measurements (metric). Note: The inside of your ring should be used to measure the Ring Size, not the outside. The fourth method is to print off the below image and check that the printer is set to 100%. You can verify that the Ring Sizer printed correctly by measuring it with a ruler; it should measure from left to right: 3 1/2 inches. Wrap a piece of loose string or paper around your finger. Be sure to allow for the size of your knuckle. With a pen, mark the point on the string or paper where the end meets. Using the chart, place the end of the string or paper on the left hand line next to the letter “A” and stretch the string or paper along the Ring Sizer toward the numbers. The pen mark on your string or paper should line up with a number to indicate your ring size. Note: The US Sizes are the same as the Australian Sizes.